Sometimes, when I want to eat something I know I shouldn’t, I ask myself which I want more: flat sculpted abs, or that treat. While the answer varies wildly, right now I am hedging towards the first choice. Flatter abs, more energy and less stomach aches to be precise. The only way I know how to achieve all that is to go back to the extreme version of Paleo that I was on successfully last summer.You can read about it starting here. I won’t bore you with the details, but I will say it is a little harder in the winter. Harder to go out in the cold to buy all the foods I need to have on hand to make this work. Harder to be seduced by all the fresh produce lining the stalls in Union Square, when there are only a few vendors selling the basics. Due to the fact that I don’t like meat, it is much harder to get that warm, comforting feeling that we all want in the winter. Most of the time it isn’t really that difficult to eat this way if I am prepared. I can have all the vegetables, fruit, poultry and fish I want. But in eliminating legumes, grains, and dairy along with sugar and alchohol, sometimes it just gets dull. I mean, giving up all beans, dairy and grains for an almost vegatarian is a bit of a sacrifice. Just one of those categories would open up the menu choices dramatically. 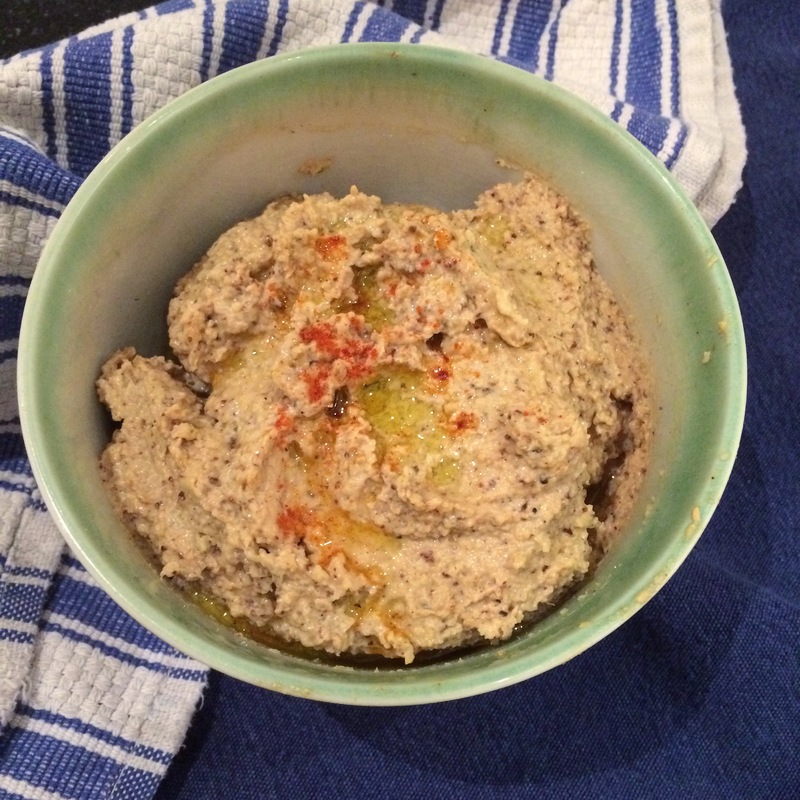 I stumbled upon a recipe for Paleo hummas on Livin Paleo, and had to give it try. The chickpeas are replaced by, of all things, CAULIFLOWER! Is there anything that ball of white florets can’t do? It is truly the chameleon of the vegetable world. It can fake us out for mashed potatoes and rice, masquerade as a pizza crust, and stand in for a steak. This time, it acts as a base for a creamy, somehwhat spicy hummus. Clean one head of cauliflower and separate it into florets. Toss it lightly in olive oil, cumin, paprika and salt. Peel a couple of cloves of garlic and and toss them in. Roast in a 500 degree oven for about 30 minutes, or until soft. Place the cooked cauliflower and garlic into the food processor and add a couple of tablespoons of olive oil, 1/2 cup of tahini and the juice of 1/2 a lemon. Blend until smooth. At this point you can adjust the seasonings to taste, adding a little more lemon,garlic, tahini, salt or cumin to the mixture. Transfer to a serving bowl, drizzle with olive oil and enjoy with cut vegetables. New York is experiencing a blizzard today, and everyone is longing for something warm, and hearty. Slow days like this call for slow cooking. This dish has all the right elements for a snow day. It comes together in no time, and fills the house with a delicious aroma of things to come. It is also made from things I have on hand since venturing out to the grocery store is not really an option. 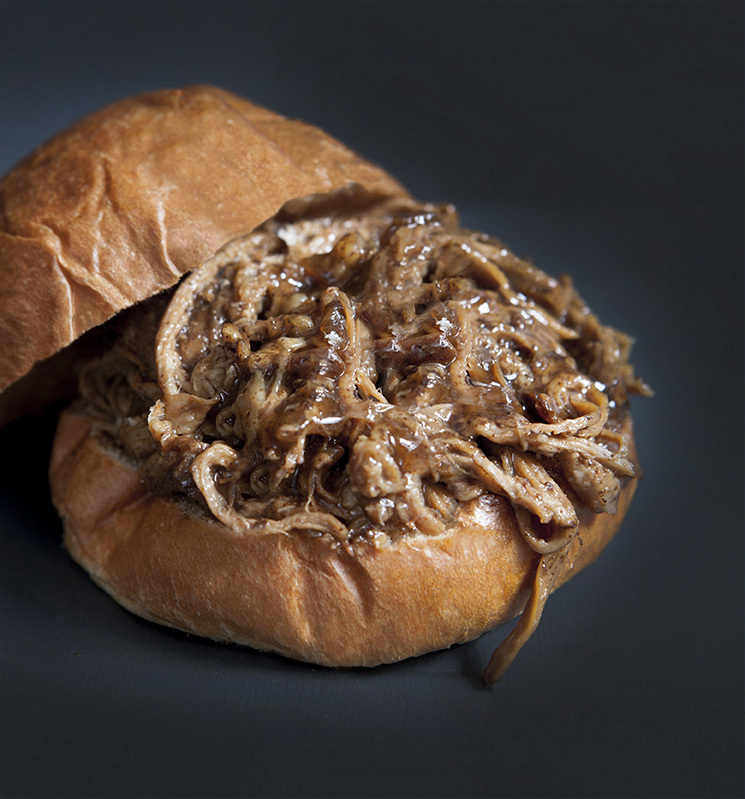 This is one of the easiest ways to use the slow cooker, as this pulled pork requires no marinating, no pre-searing of the meat and almost no mess. Simply place the pork tenderloin in the slow cooker, add the one bowl sauce, and let it cook. Later, the tender, juicy meat can be shredded and served on fluffy brioche buns for a comfort food sandwich that everyone will enjoy. Place a pork tenderloin into the slow cooker bowl. In a separate bowl mix together 1/2 cup of balsamic vinegar, 1 cup of water, 1/4 cup of honey, 3 tablespoons of brown sugar and 2 tablespoons of soy sauce. Add a couple of diced garlic cloves and about 1/2 of a small onion finely diced. Sprinkle the pork with a black pepper and pour the sauce over it. Cover, and cook at high for about 4 1/2 -5 hours. Drain the sauce into a sauce pan and bring to a slow boil. Mix together a tablespoon of cornstarch and a some water until it forms a smooth paste. Whisk a little at a time into the sauce, and let it simmer for a few minutes until thickened. Serve on toasted brioche buns and enjoy! 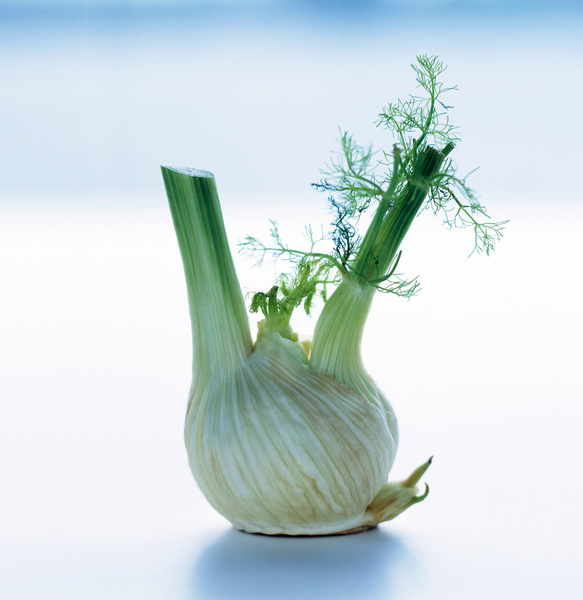 There are lots of healthy foods out there and you can’t go wrong with fresh, seasonal produce. But did you know that the way you prepare them may actually up the nutritional benefits of some of your favorite foods? We often cut our carrots, since looking like Bugs Bunny has never been our thing. Even those store bought baby carrots have been put through a machine to shave them down into smaller, more manageable bites. Studies have found that cutting carrots increases the surface size allowing some of the vital nutrients to seep out. Cooking them increases the bioavailability of the antioxident rich carotenoids. Wash and peel carrots and toss them whole into soups, stews or roast them in the oven, to get the most benefit from eating them. Garlic contains a compound called allicin, which has antibiotic properties, and is thought to decrease blood pressure.Allicin does not naturally occur in the garlic bulb, but is produced when the garlic is crushed, or finely diced. Allicin is a bit flightily, and begins to degrade the moment it is created. Cooking helps that process along, and microwaving destroys it completely. For maximum health benefits, add a little finely diced raw garlic to cooked food, if the flavor is not too strong for your taste. Broccoli is a popular vegetable, and can be an effective cancer preventer. How you cook it however, determines just how much of those cancer fighters are present. Steaming is the only method that preserves or possibly increases those properties. Frying and boiling were found to be the worst. Find steamed broccoli a bit dull? Researchers also found that adding spicy foods upped the cancer fighting ante. Go ahead and steam it, and toss it in a spicy sauce! Eating your vegetables, no matter how they are prepared is a win. Knowing how to get the most from them is a triumph! This is a hearty dish that warms your soul on a dreary autumn day. Sautéed chicken is seared and then braised in the oven in a Moroccan inspired spicy tomato sauce. It holds it’s own as a vegetarian option as well. Simply leave out the chicken and substitute vegetable broth for a savory chickpea stew. While a more traditional interpretation uses chicken thighs, we liked lightening it up a bit with boneless, skinless chicken breasts. Season chicken pieces with salt and pepper and cook them in a little olive oil in an oven proof skillet until both sides are brown. Remove them and put them on a plate. Set aside. Add a diced onion and a couple of cloves of diced garlic to the pan, and sauté until softened. Add a couple of tablespoons of tomato paste to the pan and stir. Add 1 can of chickpeas (rinsed), about 1/2 cup of chicken broth and a couple of tablespoons of harissa paste* to the pan. Bring to a simmer and place the chicken back into the skillet. 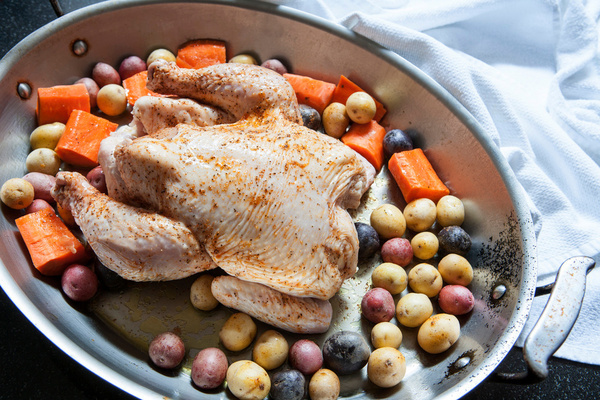 Transfer to the oven, and roast until the chicken is cooked through, about 20-25 minutes. Serve on a bed of rice (we used cauliflower rice which is the perfect foil for the spiciness and low in calories) and enjoy! 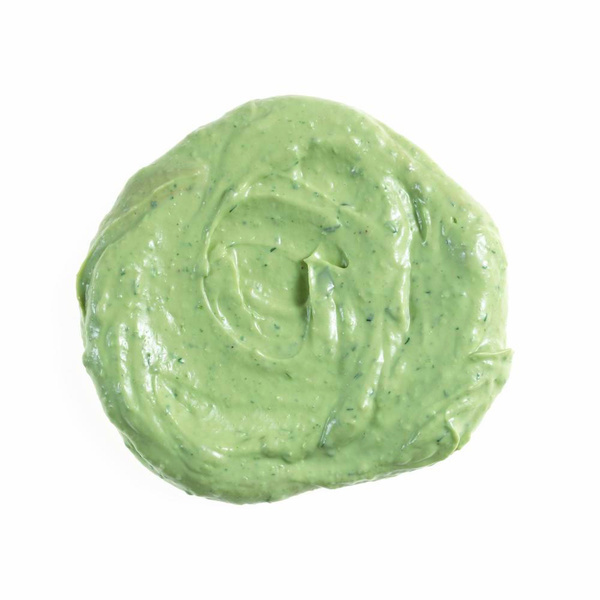 *Harissa paste is a blend of hot peppers and olive oil, garlic, and aromatic spices such as cumin and coriander. It is available at fine grocery stores in the international foods aisle. We bought ours in a jar at Whole Foods. Each type of harissa is different, so adjust the quantity to accommodate your palette.